SMALL 10 x 13.3 in. (255 x 338 mm) 12 x 17 in. MEDIUM 15.75 x 21 in. (400 x 530 mm) 19.25 x 24 in. 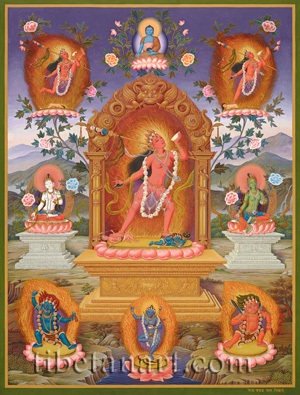 This painting shows the goddess Vajrayogini at the centre of a nine-deity composition, and is unusual in depiction all of the deities as they would naturally appear from the viewer's perspective. Vajrayogini's 'secret place' or pubic area is positioned at the exact centre of the painting, with all the perspective lines of the three central thrones converging at this focal point. The painting's perspective is similarly enhanced by the soft light source that emanates from the left, which casts small shadows to the right of each lotus and throne. Vajrayogini is depicted here in her form as Naro Khandroma, whose practice is associated with the Indian Mahasiddha Naropa. She stands in alidha posture amidst a blazing mass of wisdom fire, leaning towards the left with her left leg bent and her right leg extended. With her right and left feet she tramples upon the four-armed forms of black Bhairavi and red Kalaratri, who lie upon the golden sun disc of her pink lotus pedestal. Bhairava, the 'terrible', is the wrathful, three-eyed, blue-black form of Mahadeva (Shiva), and he wears a tiger-skin loincloth, a five-skull crown, and jewel ornaments. With his first pair of hands he makes the bindu-kapala-mudra, and with his second pair of hands he holds a sword and a shield. Vajrayogini's toes press Bhairava's head backward to the level of his heart, symbolizing that she subdues the ignorance and anger of this worldly god, as his forehead is the seat of ignorance and his heart the seat of anger. Kalaratri, the 'dark night' is a wrathful red form of Mahadevi (Bhairavi), who has three eyes, a sunken face, an emaciated body, sagging breasts and thin limbs, which indicates she is barren and does not produce anything. She wears a tiger-skin loincloth, a five-skull crown, and jeweled ornaments. With her first pair of hands Kalaratri holds a curved knife and skull-cup (not visible), and with her second pair she holds a damaru and a khatvanga. Vajrayogini's right foot presses upon Kalaratri's breasts, symbolizing that she subdues the desire of this mundane goddess, as her breasts are the seat of desire and craving. These two mundane or worldly deities represent the method and wisdom aspects of Vajrayogini's great bliss and emptiness, and her abandonment of the two extremes of samsara and nirvana. Vajrayogini is radiant and red like a hibiscus flower, with three eyes and two arms. She is naked, beautiful, passionate, and as youthful as a sixteen-year-old, with firm breasts, a nubile body, and long black hair that flows freely behind her back. She wears a long billowing orange scarf of gossamer silk, a jeweled five-skull crown, necklaces of gold, pearls and silver, golden ornaments, a bone apron, and a garland of fifty dry white skulls. Resting upon her left shoulder is the golden shaft of her khatvanga or tantric staff, which is equal in length to her own body, and sealed at its base with a half-vajra. The top of her khatvanga is crowned with a crossed-vajra and golden nectar vase, Bhairava's impaled blue head, a human head, a dry white skull, and a half-vajra. Tied to the upper shaft of her khatvanga is a billowing silk ribbon, and from the base of the nectar vase hangs a golden chain bearing a small damaru and bell. Vajrayogini's head is inclined towards the left as she gazes upward towards Khechara, the Pure Land of the Dakinis. With her raised left arm she holds a tilted skull-cup full of fresh blood, which she pours into her open mouth as the 'nectar of great bliss'. Her right arm is extended downwards as she circles a vajra- handled curved knife towards the ten directions, with her index finger raised in the threatening tarjani gesture to terrify all demons. Vajrayogini's pink lotus rests upon an elaborate golden throne, with the archway of her golden torana appearing behind her. The four lower steps on her throne's base are decorated with scrolling tendrils and wheel motifs, its five upper steps with lotus petal and pearl motifs, with a central frieze of scrolling roundels that contain swan motifs. Her throne's main facade depicts a pair of flying garudas, with the blazing offering of a skull-cup at the centre, which is filled with swirling blood, torn-out eyes, and a tongue. Her golden enlightenment-throne or torana arises from a pair of treasure-vases, with embellished eight-sided pillars ascending above them. A jewel-grasping dragon coils around each pillar, and above are the decorative capitals of the upper gateway, upon which stand two crocodiles or makaras. From the ferocious mouth of each makara protrudes a crest with little hanging bells, and their fabulous tails swirl upward to form the torana's upper arch, with its crowning image of the serpent-devouring head of Chepu or kirtimukha. Directly to Vajrayogini's right and left are White Tara and Green Tara, who each appear in partial profile due to their depicted perspectives. Both goddesses sit upon moon discs, pink lotus seats, and ornate silver thrones, with embossed vases and wish-fulfilling vines on their central panels. Amidst the blazing mass of awareness fire at the bottom centre stands Nairatma, the blue yidam goddess and consort of Hevajra. Nairatma, meaning 'no-self', dances in 'bow and arrow' posture, with her left foot trampling upon the form of a naked woman, who lies upon the sun disc of her lotus pedestal. Nairatma is semi-wrathful, with three piercing eyes, and her beautiful naked body is adorned with gold ornaments, filigree bone ornaments, a five-skull crown, and a garland of dry white skulls. With her left hand she holds a skull-cup full of blood in front of her heart, with her khatvanga resting in the crook of her left arm. And with her right hand she holds aloft the vajra-handled curved knife of the dakinis. In the lower left and right corners are the wrathful forms of blue Vajrapani and red Khadgapani, who each lean to the left and right on their respective sun discs and lotuses. They each have three eyes and are surrounded by a blazing mass of awareness fire. Their powerful bodies are adorned with golden ornaments, tiger-skin loincloths, and garlands of severed heads. Vajrapani holds aloft his two attributes of a golden vajra and a rope-noose in his right and left hands. And Khadgapani holds aloft his iron sword and rope-noose. From behind Vajrayogini's torana arise three foliated stems that culminate in the lotus thrones of three deities, with each lotus curving upwards to emphasize its elevated position. At the top center is blue Akshobhya Buddha, the 'Lord of the Vajra Family', who sits in vajra-posture upon a moon disc and lotus wearing the three red monastic robes. With his right hand Akshobhya makes the 'earth-witness' gesture, while his left hand rests upon his lap in the gesture of meditation as he supports his blue alms-bowl. To the right of Akshobhya is Vajrayogini in her flying form as Vidyadhari, the 'Knowledge-holder'. And to Akshobhya's left is Vajrayogini in her 'Raised Foot' or 'urdhvapada' aspect, with her extended right foot pressing upon the back of a yellow woman who crouches upon her sun disc. Collectively these four semi-wrathful Dakinis represent the four main aspects of Vajrayogini in the Newar Buddhist tradition, whose temples are located at Bijeshvari (Vidyadhari Yogini), Pharping (Urdvapada Yogini), Sankhu (Naro-dakini), and Guhyeshvari (Nairatma). This beautiful composition was painted by Devendra Man Sinkhwal, and took about five months to complete.